A proximity fuze is a fuze that detonates an explosive device automatically when the distance to the target becomes smaller than a predetermined value. Proximity fuzes are designed for targets such as planes, missiles, ships at sea, and ground forces. They provide a more sophisticated trigger mechanism than the common contact fuze or timed fuze. It is estimated that it increases the lethality by 5 to 10 times, compared to these other fuzes. British military researchers W. A. S. Butement, Edward S. Shire, and Amherst F. H. Thomson conceived of the idea of a proximity fuze in the early stages of World War II. In fact, the idea of a fuze was not new. Their system involved a small, short range, Doppler radar. British tests were then carried out with "unrotated projectiles," in this case rockets. However, British scientists were uncertain whether a fuze could be developed for anti-aircraft shells, which had to withstand much higher gravitational forces than rockets. The British shared a wide range of possible ideas for designing a fuze, including a photoelectric fuze and a radio fuze, with United States during the Tizard Mission in late 1940. To work in shells, a fuze needed to be miniaturized, survive the high acceleration of cannon launch, and be reliable. The National Defense Research Committee assigned the task to the physicist Merle A. Tuve at the Department of Terrestrial Magnetism. Also eventually pulled in were researchers from the National Bureau of Standards (this research unit of NBS later became part of the Army Research Laboratory). Work was split in 1942, with Tuve's group working on proximity fuzes for shells, while the National Bureau of Standards researchers focused on the technically easier task of bombs and rockets. Work on the radio shell fuze was completed by Tuve's group, known as Section T, at The Johns Hopkins University Applied Physics Lab (APL). Over 100 American companies were mobilized to build some 20 million shell fuzes. "One of the most original and effective military developments in World War II was the proximity, or 'VT', fuze. It found use in both the Army and the Navy, and was employed in the defense of London. While no one invention won the war, the proximity fuze must be listed among the very small group of developments, such as radar, upon which victory very largely depended." The fuze was later found to be able to detonate artillery shells in air bursts, greatly increasing their anti-personnel effects. The Germans were supposedly also working on proximity fuzes in the 1930s, based on capacitive effects rather than radar. Research and prototype work at Rheinmetall were halted in 1940 to devote available resources to projects deemed more necessary. In the post-World War II era, a number of new proximity fuze systems were developed, including radio, optical, and other means. A common form used in modern air-to-air weapons uses a laser as an optical source and time-of-flight for ranging. Before the proximity fuze's invention, detonation was induced by direct contact, a timer set at launch, or an altimeter. All of these earlier methods have disadvantages. The probability of a direct hit on a small moving target is low; a shell that just misses the target will not explode. A time- or height-triggered fuze requires both a good prediction by the gunner and accurate timing by the fuze. If either is wrong, then even accurately aimed shells may explode harmlessly before reaching the target or after passing it. "In 1940 it was generally estimated that good antiaircraft brought down one plane for every 2500 rounds." With a proximity fuze, the shell or missile need only pass close by the target at some time during its trajectory. The proximity fuze makes the problem simpler than the previous methods. Proximity fuzes are also useful for producing air bursts against ground targets. A contact fuze would explode when it hit the ground; it would not be very effective at scattering shrapnel. A timer fuze can be set to explode a few meters above the ground, but the timing is critical and usually requires observers to provide information for adjusting the timing. Observers may not be practical in many situations, the ground may be uneven, and the practice is slow in any event. Proximity fuzes fitted to such weapons as artillery and mortar shells solve this problem by having a range of pre-set burst heights (e.g. 2, 4 or 10 metres, or about 7, 13, or 33 feet) above ground that are selected by gun crews prior to firing. The shell bursts at the appropriate height above ground. ...Into this stepped W. A. S. Butement, designer of radar sets CD/CHL and GL, with a proposal on 30 October 1939 for two kinds of radio fuze: (1) a radar set would track the projectile, and the operator would transmit a signal to a radio receiver in the fuze when the range, the difficult quantity for the gunners to determine, was the same as that of the target and (2) a fuze would emit high-frequency radio waves that would interact with the target and produce, as a consequence of the high relative speed of target and projectile, a Doppler-frequency signal sensed in the oscillator. The first radar proximity fuze was proposed by Butement, Edward S. Shire, and Amherst F.H. Thompson, in a memo to the British Air Defence Establishment in May 1940. A breadboard circuit was constructed by the inventors and the concept was tested in the laboratory by moving a sheet of tin at various distances. Early field testing connected the circuit to a thyratron trigger operating a tower-mounted camera which photographed passing aircraft to determine distance of fuze function. Prototype fuzes were then constructed in June 1940, and installed in "unrotated projectiles", the British cover name for solid fueled rockets, and fired at targets supported by balloons. Rockets have relatively low acceleration and no spin creating centrifugal force, so the loads on the delicate electronic fuze are relatively benign. It was understood that the limited application was not ideal; a proximity fuze would be useful on all types of artillery and especially anti-aircraft artillery, but they had very high accelerations. As early as September 1939, John Cockcroft began a development effort at Pye Ltd. to develop tubes capable of withstanding these much greater forces. Pye's research was transferred to the United States as part of the technology package delivered by the Tizard Mission when the United States entered the war. The British ordered 20,000 special miniature tubes from Western Electric Company and Radio Corporation of America, and an American team under Admiral Harold G. Bowen, Sr. correctly deduced that the tubes were meant for experiments with proximity fuzes. The details of these experiments were passed to the United States Naval Research Laboratory and National Defense Research Committee (NDRC) by the Tizard Mission in September 1940, in accordance with an informal agreement between Winston Churchill and Franklin D. Roosevelt to exchange scientific information of potential military value. Following receipt of details from the British, the experiments were successfully duplicated by Richard B. Roberts, Henry H. Porter, and Robert B. Brode under the direction of NDRC section T chairman Merle Tuve. Lloyd Berkner of Tuve's staff devised an improved fuze using separate tubes (British English: thermionic valves or just "valves") for transmission and reception. In December 1940, Tuve invited Harry Diamond and Wilbur S. Hinman, Jr, of the United States National Bureau of Standards (NBS) to investigate Berkner's improved fuze and develop a proximity fuze for non-rotated, or fin-stabilized, projectiles to use against the German Luftwaffe. In just two days, Diamond was able to come up with a new fuze design and managed to demonstrate its feasibility through extensive testing at the Naval Proving Ground at Dahlgren, Virginia. On May 6, 1941, the NBS team built six fuzes which were placed in air-dropped bombs and successfully tested over water. Given their previous work on radio and radiosondes at NBS, Diamond and Hinman developed the first all solid-state radio doppler proximity fuze, which employed the Doppler effect of reflected radio waves using a diode detector arrangement that they devised. The use of the Doppler effect developed by this group would go on to be incorporated in all radio proximity fuzes for bomb, rocket, and mortar applications. Later, the Ordnance Development Division of the National Bureau of Standards (which became the Harry Diamond Laboratories – and later merged into the Army Research Laboratory – in honor of its former chief in subsequent years) developed the first automated production techniques for manufacturing radio proximity fuzes at a low cost. While working for a defense contractor in the mid-1940s, Soviet spy Julius Rosenberg stole a working model of an American proximity fuze and delivered it to the Soviet intelligence. In the USA, NDRC focused on radio fuzes for use with anti-aircraft artillery, where acceleration was up to 20,000 g as opposed to about 100 g for rockets and much less for dropped bombs. In addition to extreme acceleration, artillery shells were spun by the rifling of the gun barrels to close to 30,000 rpm, creating immense centrifugal force. Working with Western Electric Company and Raytheon Company, miniature hearing-aid tubes were modified to withstand this extreme stress. The T-3 fuze had a 52% success against a water target when tested in January, 1942. The United States Navy accepted that failure rate. A simulated battle conditions test was started on 12 August 1942. Gun batteries aboard cruiser USS Cleveland (CL-55) tested proximity-fuzed ammunition against radio-controlled drone aircraft targets over Chesapeake Bay. The tests were to be conducted over two days, but the testing stopped when drones were destroyed early on the first day. The three drones were destroyed with just four projectiles. A particularly successful application was the 90 mm shell with VT fuze with the SCR-584 automatic tracking radar and the M-9 electronic fire control computer. The combination of these three inventions was successful in shooting down many V-1 flying bombs aimed at London and Antwerp, otherwise difficult targets for anti-aircraft guns due to their small size and high speed. In Germany, more than 30 approaches to proximity fuze development were under way, but none saw service. These included acoustic fuzes triggered by engine sound, one based on electrostatic fields developed by Rheinmetall Borsig AG, and radio fuzes. A German neon lamp tube and a design of a prototype proximity fuze based on capacitive effects was received by British Intelligence in mid November 1939. By the end of the war, only one was actually in production, a complicated radio proximity fuze for rockets and bombs (but not designed to withstand the acceleration of artillery shells). The Allied fuze used constructive and destructive interference to detect its target. The design had four tubes. One tube was an oscillator connected to an antenna; it functioned as both a transmitter and an autodyne detector (receiver). When the target was far away, little of the oscillator's transmitted energy would be reflected back to the fuze. When a target was nearby, it would reflect a significant portion of the oscillator's signal back. The amplitude of the reflected signal corresponded to the closeness of the target. [notes 1] This reflected signal would affect the oscillator's plate current, thereby enabling detection. However, the phase relationship between the oscillator's transmitted signal and the signal reflected from the target varied depending on the round trip distance between the fuze and the target. When the reflected signal was in phase, the oscillator amplitude would increase and the oscillator's plate current would also increase. But when the reflected signal was out of phase then the combined radio signal amplitude would decrease, which would decrease the plate current. So the changing phase relationship between the oscillator signal and the reflected signal complicated the measurement of the amplitude of that small reflected signal. This problem was resolved by taking advantage of the change in frequency of the reflected signal. The distance between the fuze and the target was not constant but rather constantly changing due to the high speed of the fuze and any motion of the target. When the distance between the fuze and the target changed rapidly, then the phase relationship also changed rapidly. The signals were in-phase one instant and out-of-phase a few hundred microseconds later. The result was a heterodyne beat frequency which corresponded to the velocity difference. Viewed another way, the received signal frequency was Doppler-shifted from the oscillator frequency by the relative motion of the fuze and target. Consequently, a low frequency signal, corresponding to the frequency difference between the oscillator and the received signal, developed at the oscillator's plate terminal. Two of the four tubes in the VT fuze were used to detect, filter, and amplify this low frequency signal. Note here that the amplitude of this low frequency 'beat' signal corresponds to the amplitude of the signal reflected from the target. If the amplified beat frequency signal's amplitude was large enough, indicating a nearby object, then it triggered the 4th tube - a gas-filled thyratron. Upon being triggered, the thyratron conducted a large current that set off the electrical detonator. In order to be used with gun projectiles, which experience extremely high acceleration and centrifugal forces, the fuze design also needed to utilize many shock hardening techniques. These included planar electrodes and packing the components in wax and oil to equalize the stresses. The designation VT means variable time. Captain S. R. Shumaker, Director of the Bureau of Ordnance's Research and Development Division, coined the term to be descriptive without hinting at the technology. The anti-aircraft artillery range at Kirtland Air Force Base in New Mexico was used as one of the test facilities for the proximity fuze, where almost 50,000 test firings were conducted from 1942 to 1945. Testing also occurred at Aberdeen Proving Ground in Maryland, where about 15,000 bombs were fired. Other locations include Ft. Fisher in North Carolina and Blossom Point, Maryland. First large scale production of tubes for the new fuzes was at a General Electric plant in Cleveland, Ohio formerly used for manufacture of Christmas-tree lamps. Fuze assembly was completed at General Electric plants in Schenectady, New York and Bridgeport, Connecticut. 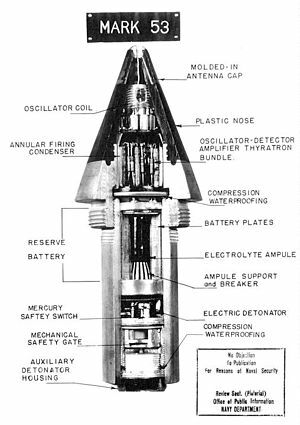 Once inspections of the finished product were complete, a sample of the fuzes produced from each lot was shipped to the National Bureau of Standards, where they were subjected to a series of rigorous tests at the specially built Control Testing Laboratory. These tests included low- and high-temperature tests, humidity tests, and sudden jolt tests. By 1944, a large proportion of the American electronics industry concentrated on making the fuzes. Procurement contracts increased from $60 million in 1942, to $200 million in 1943, to $300 million in 1944 and were topped by $450 million in 1945. As volume increased, efficiency came into play and the cost per fuze fell from $732 in 1942 to $18 in 1945. This permitted the purchase of over 22 million fuzes for approximately one billion dollars. The main suppliers were Crosley, RCA, Eastman Kodak, McQuay-Norris and Sylvania. There were also over two thousand suppliers and subsuppliers, ranging from powder manufacturers to machine shops. It was among the first mass-production applications of printed circuits. Vannevar Bush, head of the U.S. Office of Scientific Research and Development (OSRD) during the war, credited the proximity fuze with three significant effects. It was important in defense from Japanese Kamikaze attacks in the Pacific. Bush estimated a sevenfold increase in the effectiveness of 5-inch antiaircraft artillery with this innovation. It was an important part of the radar-controlled antiaircraft batteries that finally neutralized the German V-1 attacks on England. It was used in Europe starting in the Battle of the Bulge where it was very effective in artillery shells fired against German infantry formations, and changed the tactics of land warfare. At first the fuzes were only used in situations where they could not be captured by the Germans. They were used in land-based artillery in the South Pacific in 1944. Also in 1944, fuzes were allocated to the British Army's Anti-Aircraft Command, that was engaged in defending Britain against the V-1 flying bomb. As most of the British heavy anti-aircraft guns were deployed in a long, thin coastal strip, dud shells fell into the sea, safely out of reach of capture. Over the course of the German V-1 campaign, the proportion of flying bombs flying through the coastal gun belt that were destroyed rose from 17% to 74%, reaching 82% during one day. A minor problem encountered by the British was that the fuzes were sensitive enough to detonate the shell if it passed too close to a seabird and a number of seabird "kills" were recorded. The Pentagon refused to allow the Allied field artillery use of the fuzes in 1944, although the United States Navy fired proximity-fuzed anti-aircraft shells during the July 1943 invasion of Sicily. After General Dwight D. Eisenhower demanded he be allowed to use the fuzes, 200,000 shells with VT fuzes or (code named "POZIT") were used in the Battle of the Bulge in December 1944. They made the Allied heavy artillery far more devastating, as all the shells now exploded just before hitting the ground. The Germans felt safe from timed fire because they thought that the bad weather would prevent accurate observation. The effectiveness of the new VT fuzed shells exploding in mid-air, on exposed personnel, caused a minor mutiny when German soldiers started refusing orders to move out of their bunkers during an artillery attack. U.S. General George S. Patton said that the introduction of the proximity fuze required a full revision of the tactics of land warfare. Proximity fuzes were incorporated into bombs dropped by the USAAF on Japan in 1945. The Germans started their own independent research in the 1930s but the programme was cut in 1940 likely due to the Führer Directive (Führerbefehl) that, with few exceptions, stipulated all work that could not be put into production within 6 months was to be terminated to increase resources for those projects that could (in order to support Operation Barbarossa). It was at this time that the Germans also abandoned their magnetron and microwave radar development teams and programs. Many other advanced and experimental programs also suffered. Upon resumption of research and testing by Rheinmetall in 1944 the Germans managed to develop and test fire several hundred working prototypes before the war ended. Radio frequency sensing is the main sensing principle for artillery shells. The device described in World War II patent works as follows: The shell contains a micro-transmitter which uses the shell body as an antenna and emits a continuous wave of roughly 180–220 MHz. As the shell approaches a reflecting object, an interference pattern is created. This pattern changes with shrinking distance: every half wavelength in distance (a half wavelength at this frequency is about 0.7 meters), the transmitter is in or out of resonance. This causes a small cycling of the radiated power and consequently the oscillator supply current of about 200–800 Hz, the Doppler frequency. This signal is sent through a band pass filter, amplified, and triggers the detonation when it exceeds a given amplitude. Optical sensing was developed in 1935, and patented in Great Britain in 1936, by a Swedish inventor, probably Edward W. Brandt, using a petoscope. It was first tested as a part of a detonation device for bombs that were to be dropped over bomber aircraft, part of the UK's Air Ministry's "bombs on bombers" concept. It was considered (and later patented by Brandt) for use with anti-aircraft missiles fired from the ground. It used then a toroidal lens, that concentrated all light from a plane perpendicular to the missile's main axis onto a photo cell. When the cell current changed a certain amount in a certain time interval, the detonation was triggered. Some modern air-to-air missiles (e.g. the ASRAAM and AA-12 Adder) use lasers to trigger detonation. They project narrow beams of laser light perpendicular to the flight of the missile. As the missile cruises towards its target the laser energy simply beams out into space. As the missile passes its target some of the energy strikes the target and is reflected back to the missile, where detectors sense it and detonate the warhead. Acoustic sensing uses a microphone in a missile[which?] or other explosive device. The characteristic frequency of an aircraft engine is filtered and triggers the detonation. This principle was applied in British experiments with bombs, anti-aircraft missiles, and airburst shells in about 1939. Later it was applied in German anti-aircraft missiles, which were mostly still in development when the war ended. The British used a Rochelle salt microphone and a piezoelectric device to trigger a relay to detonate the projectile or bomb's explosive. Naval mines can also use acoustic sensing with an acoustic fuze, with modern versions able to be programmed to "listen" for the signature of a specific ship. Magnetic sensing can only be applied to detect huge masses of iron such as ships. It is used in mines and torpedoes. Fuzes of this type can be defeated by degaussing, using non-metal hulls for ships (especially minesweepers) or by magnetic induction loops fitted to aircraft or towed buoys. Some naval mines are able to detect the pressure wave of a ship passing overhead. The designation "VT" is often said to refer to "variable time". Fuzed munitions before this invention were set to explode at a given time after firing, and an incorrect estimation of the flight time would result in the munition exploding too soon or too late. The VT fuze could be relied upon to explode at the right time—which might vary from that estimated. One theory is that "VT" was coined simply because Section "V" of the Bureau of Ordnance was in charge of the programme and they allocated it the code-letter "T". This would mean that the initials also standing for "variable time" was a happy coincidence that was supported as an intelligence smoke screen by the allies in World War II to hide its true mechanism. An alternative is that it was deliberately coined from the existing "VD" (Variable Delay) terminology by one of the designers. Developed by the US Navy, development and early production was outsourced to the Wurlitzer company, at their barrel organ factory in North Tonawanda, New York. A 155mm artillery fuze with selector for point/proximity detonation (currently set to proximity). ^ The return signal is inversely proportional to the fourth power of the distance. ^ Hinman, Wilbur S (1957). "Portrait of Harry Diamond". Proceedings of the IRE: 443. Retrieved 18 December 2015. ^ a b U.S. Army Materiel Command (1963). Research and Development of Material Engineering Design Handbook Ammunition Series: Fuzes, Proximity, Electrical Part One (U) (PDF). ^ a b Cochrane, Rexmond (1976). Measures for progress: A history of the National Bureau of Standards (PDF). Arno Press. pp. 388–399. ISBN 978-0405076794. ^ Hinman, Jr., Wilbur. "Portrait of Harry Diamond". IEEE Xplore Digital Library. Retrieved June 18, 2018. ^ "Artillery Proximity Fuses". warfarehistorynetwork.com. Retrieved 2018-06-18. ^ a b c "Radio Proximity Fuzes" (PDF). Retrieved June 18, 2018. ^ a b Johnson, John; Buchanan, David; Brenner, William (July 1984). "Historic Properties Report: Harry Diamond Laboratories, Maryland and Satellite Installations Woodbridge Research Facility, Virginia and Blossom Point Field Test Facility, Maryland". Defense Technical Information Center. ^ Howeth, Linwood S. (1963). History of Communications-Electronics in the United States Navy. United States Government Printing Office. p. 498. LCCN 64-62870. ^ Bureau of Ordnance 1946, p. 36 shows a fifth tube, a diode, used for a low trajectory wave suppression feature (WSF). ^ Rowland, Buford; Boyd, William B. (1953). U. S. Navy Bureau of Ordnance in World War II. Washington, D.C.: Bureau of Ordnance, Department of the Navy. p. 279. ^ U.S. Army Corps of Engineers (8 August 2008). "Request for information about the Isleta Pueblo Ordnance Impact Area" (PDF). Isleta Pueblo News. Vol. 3 no. 9. p. 12. Archived (PDF) from the original on 26 March 2017. ^ Eisler, Paul; Williams, Mari (1989). My Life with the Printed Circuit. Lehigh University Press. ISBN 978-0-934223-04-1. ^ Dobinson, Colin (2001). AA Command: Britain's Anti-aircraft Defences of World War II. Methuen. p. 437. ISBN 978-0-413-76540-6. ^ Potter, E.B. ; Nimitz, Chester W. (1960). Sea Power. Englewood Cliffs, New Jersey: Prentice-Hall. pp. 589–591. ^ Albert D. Helfrick (2004). Electronics In The Evolution Of Flight. Texas A&M UP. p. 78. ISBN 9781585444137. ^ Rick Atkinson (2013). The Guns at Last Light: The War in Western Europe, 1944-1945. pp. 460–62, 763–64. ISBN 9781429943673. ^ http://www.navweaps.com/index_tech/tech-102.htm Proximity Fuze - what does "VT" mean?. ^ Navy presents high award to Wurlitzer men. Billboard magazine. 15 Jun 1946. Baldwin, Ralph B. (1980), The Deadly Fuze: The Secret Weapon of World War II, San Rafael, CA: Presidio Press, ISBN 978-0-89141-087-4 . Baldwin was a member of the (APL) team headed by Tuve that did most of the design work. Bush, Vannevar (1970), Pieces of the Action, New York: William Morrow and Company, Inc.
Allen, Kevin. "Artillery Proximity Fuses". Warfare History Network. Retrieved 4 June 2018. Look up proximity fuze in Wiktionary, the free dictionary.